micro-processors in the welding power source. like job number, amps, volts and arc length. electronic, mechanical, photocopying or otherwise without the prior permission of ©Uniarc® the copyright holder. LM1 can control up to two welding functions. can change between those welding functions. be made at the start or end of the welding process. welding parameters are possible whilst " on-arc ". wants to control, with job number as the default setting. mode can be changed from job number to wire speed. decrease the wire feed speed. the function mode can be changed back to job number. 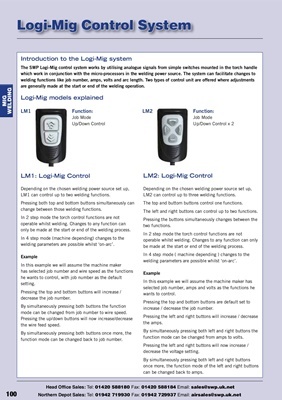 LM2 can control up to three welding functions. The top and buttom buttons control one functions. The left and right buttons can control up to two function. at the start or end of the welding process. The left and right buttons can control up to two functions. welding parameters are possible whilst 'on-arc'. increase / decrease the job number. function mode can be changed from amps to volts. can be changed back to amps. are generally made at the start or end of the welding operation. change between those welding functions. only be made at the start or end of the welding process. function mode can be changed back to job number.